Our friend myLotter John Welford (@indexer) invited us to write a Christmas story in 100 words. I am not very good in this kind of things, but, following his request, this is my Christmas Story (in 100 words). The little girl was waiting for Santa, keeping quiet under the warm covers in her bed. No noises were heard in the house, only a bell in the distance was striking midnight. Time to get up and check what Santa left under the tree, she thought. She put on her little rabbit shaped slippers, and flew down the stairs like a little fairy. A huge box, wrapped in wonderful shiny colors, was there. Too curious to wait for her parents to wake up she opened and "oh surprise" Santa was wrapped inside The picture is two of my most recent crafts, a gingerbread man and a snow man. I hope you enjoyed the story. Are you all set for Christmas? I love that! In reading that I could feel the little girl's warmth and excitement for Christmas ! Your crafts are always so adorable . We finally put up the decorations last night - we are finally "set" (except for the gift department - that still needs work ). The hat of the snowman cut into a toilet paper roll has been tricky. . I remember the days I was excited waiting for midnight, wonderful times. I always enjoy anything that you write here. You are too kind Alfredo, thank you very much. @LadyDuck your welcome there.I always give credit there. @amadeo I thank you, you are the "King of myLot". Cute little crafts. I did enjoy your short Christmas story. Thank you Marlina, I decided to join the challenge, the days when I was a kid came back to my mind. Santa had not started his work yet Your crafts are beautiful. Thank you, the snowman is cut out from an old blanket, the hat a colored toilet paper roll. @LadyDuck That´s the sort of crafts I like. @LadyDuck great use of things. I did enjoy this story. I visualize that she is a darling little girl. She must be a favorite child of dear old Santa Claus. May be Santa wanted to surprise her with a big gift and the elves wrapped him instead. @LadyDuck I like that idea!!! Cute story and adorable crafts! Love the snowman! He’s so chubby! My snowman is FATSO. I watch YouTube videos and then I am tempted to try. @LadyDuck Fatso reminds me of someone. . You did good! @DianneN I hope your Fatso is well. The days are cold, I think he sleeps a lot. I did not join the "official" contest, I only replied to the challenge on myLot, there is nothing to win, but I wanted to see what I would have been able to write. Thanks you Kharla. @LadyDuck I didn't know how it was suppose to be done. I'm not in the 'official' contest either. @kobesbuddy The matter is to write a Christmas story using only 100 words. You see - it's not so difficult! (although I think you're actually 8 words short!). Setting yourself challenges like this is an excellent way of improving your English style. I used "Hemingway Editor" to count the words, I suppose it counts the punctuation too. You are right that challenges help to improve the English style. @indexer did you count each word to make sure she followed the rules or did you use a word counter? @shaggin I copied my text in a "word counter". Some also counts the punctuation, some do not. Lovely story and like what you have made. Not ready just yet no. Thank you, I am always reluctant to write fiction stories, but a Christmas story is different. @LadyDuck I love writing short stories mainly for myself though. Christmas story is always good. @lovinangelsinstead21 I agree with you. I liked to write stories when I was young, but it was in my native language, a lot easier. Growing up, I didn't know what a gingerbread man was. But beautiful, vividly written Christmas story Anna-san. Well done. Thank you. Will you spend Christmas with your family? I hope so. @LadyDuck I will! My flight back home will be sooooon! !~ But I won't be here that much. @sol_cee I am really so glad that your are flying back home. The time with the family is always too short. Have a safe and pleasant fly, take care and Happy Holidays. First all...those pictures are great..secondly.. I think you are a great writer..putting words together to express ones thought is a gift.. And putting down those thoughts in easy to understand words and phrases always leaves me in awe of the writer..Good christmas story.. Thank you so much, you are really kind, English is not my language, so it's not always easy for me. @iamdahmmy I live in Switzerland, but I was born in Italy, Italian is my native language. so cute your little story. no i am not happy here about Christmas. this year is worst of all. finances are so bad we will be lucky to eat. i don;t know how others are surviving. worst of all, i can't get up and/or make things like i used to if i was out of funds. I am so sorry Bonnie. This is not my best Christmas, I have been through plenty of problems and I am exhausted. I only want to rest. @bunnybon7 This is something to remember. I remember the Christmas of 73, my parents, my in-laws, my brother my granny and the cousin of my husband all came to have dinner with us. I remember that it was a beautiful evening. cute crafts you did there. your Christmas story is nice. Thank you Ingrid, I had so little time left this month of December. @LadyDuck but you make good discussions. @ridingbet You are too kind, thank you Ingrid. Yes, I just have a few card to mail, and I will deliver gifts. I mailed a few cards, I am delivering some gifts, I want to finish before this week ends. What a great story and love your crafts. Thank you Carol, I had fun writing it. That's a sweet story Anna. Thank you Marie, I still see the Christmas Eve night as I did when I was a kid. I thought it was cute! Not all set for Christmas..I spent part of last night looking for scotch tape, which will turn up as soon as I buy some.. I always could not find the ribbons and bows, I cannot remember where I put them. I'm thinking it was you on the Story Anna. I thought to the times when I was a young girl waiting for midnight to get up and open the gifts. You thought correctly Bhem. @LadyDuck Yay, and you are happy receiving it every Christmas. @JustBhem Yes, when I was a kid, receiving gifts was part of the excitement of Christmas. That is a lovely story Anna - and I love your craft work. The snowman is really cute. You inspired me to try Judy. 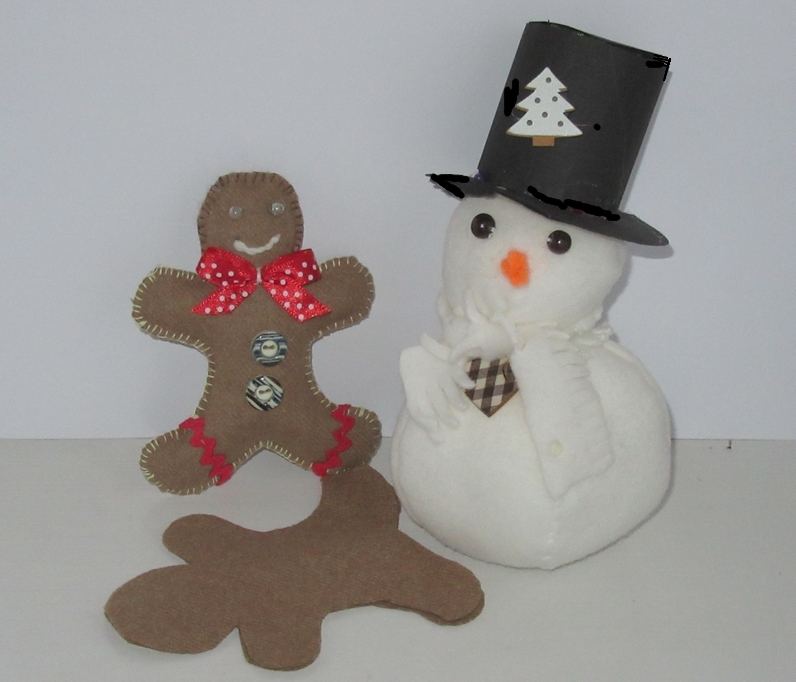 I thought it was harder to sew the snowman. The only hard part was the hat, that I made with an empty toilet paper roll. @LadyDuck I'm glad you wrote a story. I see quite a few did so that's nice too. It's amazing what you can make with what sometimes isn't it? @JudyEv I am amazed about the nice things we can do with recycled materials. I have seen we can make beautiful flowers using plastic bottles. Thank you, I am glad you like my little crafts. I only had 100 words for the story, I had to find a funny ending. @LadyDuck 100 words seem too much but when we start writing we get that number fast. @nela13 I agree, at first I thought I will never be able to write 100 words, but finally I wrote more and I had to delete some.